Environmental degradation, climate change and natural disasters are uprooting increasing numbers of people around the world. An estimated 22 million people were newly forced to up and move as a result of the more than 600 natural disasters that occurred in 2013, according to the Internal Displacement Monitoring Centre’s September 2014 Global Estimates Report. More specifically, IOM-PSIA’s “The State of Enviromental Migration 2014” report focuses on migration in the context of environmental degradation and climate change. In the course of their study, the report authors chronicle and analyze 2013’s natural disasters and the onset of slower, longer term climate and environmental changes and their links with human migration, focusing also on their implications for policy and decision-makers across the public and private sectors. Thirty-seven of 2013’s over 600 natural disasters resulted in mass migrations of between 100,000 to more than 4 million people. As was true in previous years, natural hazards led to mass migrations more frequently “in the most exposed and vulnerable countries,” IOM report authors highlight. 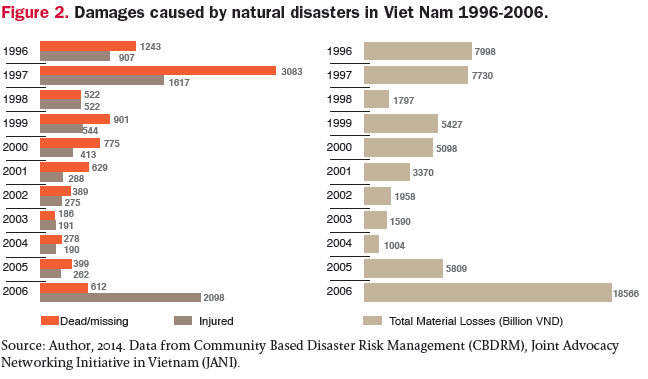 Natural disasters led to more in the way of environmental migration in Asia than any other world region in 2013. All told, 17 of 2013’s largest human displacements worldwide occurred in Asia. The devastation and human displacement in the wake of Typhoon Haiyan in the Philippines drew worldwide media attention, as well as relief and humanitarian aid. Two years on, Pope Francis is in the Philippines to visit and meet with the residents of hard-hit Tacloban City. “The pope’s visit to the Philippines and his solidarity with the poor of Tacloban should speak volumes to world leaders and government ministers tasked with adopting a series of new global agreements this year which will form the basis for tackling poverty over the next 15 to 20 years,” Margareta Wahlström, head of the United Nations Office for Disaster Risk Reduction (UNISDR), writes in the Huffington Post. Japan will host the Third UN World Conference on Disaster Risk Reduction this March. There, negotiators aim to update and strengthen the Hyogo Framework for Action in light of the latest scientific research and assessments of member nations’ preparedness and and capacity to respond to and recover from slower, longer term environmental changes as well as natural disasters. With the overarching objective of enhancing nations’ resiliency to climate change and environmental degradation, as well as reducing their vulnerability to extreme weather events and other natural disasters, the Hyogo Framework stands as the community nations’ “best effort” to address and cope with these dire threats. “Among other things, this will require a strong focus on better standards of housing for the poor and a huge effort to protect, or move, millions of people out of danger zones along storm and flood exposed coasts, river banks, unstable hillsides and seismic zones. Organization and understanding of what drives risk are essential to building resilience. World leaders pulling their fingers out and getting down to the hard work of enacting more aggressive, proactive programs and sealing a strong, lasting world climate treaty would go a long way towards addressing the root causes of environmental migration as opposed to coping from crisis to crisis, Wahlström adds.